On october 14th 2019 astronomers detected the asteroid j-2019. It was cataloged in the NEO database. In 2023 it was calculated this object would impact earth on july 4th 2036. This was not publicly announced and was kept under wraps for a year before it was leaked out to the public. Once out in the public there was a mass panic. And many suicides and every religion had a different meaning for this earth bound object. But most of all there was a deep hatred towards NASA for hiding this vital information. NASA officials were killed and many workers left NASA for their own safety. On january twenty first 2025 Roscosmos announced they will make up for where nasa has failed. They will not only protect earth from this imminent threat. But they will also protect earth from all future threats. 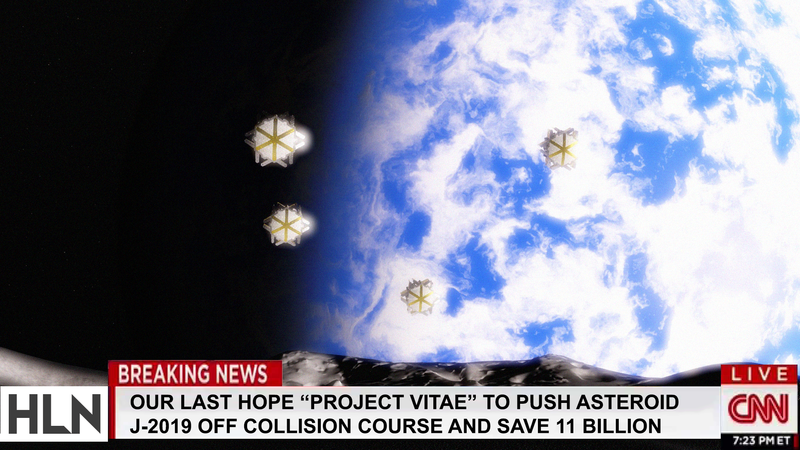 They named it project "VITAE" which is latin for "life". Project Vitae immediately got 100 billion usd funding from the russian government and many other backers donated over 1.4 trillion usd funding to project Vitae. Construction began immediately. 4 ships, Each weighing in at 12,490 tons and being over 600 meters long. This project was a massive undertaking. But it could be done. By 2030 all 4 ships had been constructed in their massive orbital berths each a kilometer long. Their goal is to push the asteroid away under their own power. However this is massive overkill and unnecessary for this many ships of this size. The reason roscosmos did this was to show off how much better than nasa they were. The remaining funds went towards the earth shield project which was a massive network of satellites equipped with high powered lasers to blast away any future earth threatening debris. On july the 3rd 2036 all for massive ships began their primary burn towards the J-2019. Vladimir putin watched from his private orbital hotel as the three ships burned towards their target. At 9:23 am moscow time all 4 ships impacted the asteroid and began burning their thrusters. For 4 hours the struggle between gravity and the ships was very interesting to watch. But in the end the ship's won and the asteroid was pushed away from earth at a peak velocity of 60 km/s. The whole world cheered and russia was announced a hero and russia became one of the most active and influential countries in space. In 2038 the first russian man landed on mars and in 2043 that same man climbed and claimed olympus mons in the name of the motherland. Shouldn't this be a movie? Good story, but a next ? For example, all human nations gather to be able to prepare in advance instead of doing almost at the last minute for a possible new alien menace (asteroids,...).